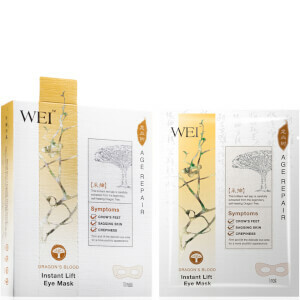 In perfect pods for travel or trial, this treatment collection features best–selling WEI masks for detoxifying, brightening, and anti-aging benefits for youthful, healthy skin. Arrives with a WEI brush, specially designed for the application of the masks. helps revitalize, hydrate, and plump the skin. Hydrates and exfoliates the skin for a flawless, radiant complexion. Deeply cleanses skin, purges toxins and impurities, and minimizes the appearance of pores and blemishes. 1. Peel off the foil from the top of a pod. 2. Brush mask on clean face, avoiding the eye area. Expect a slightly warm, tingling sensation that will go away in a few minutes. 3. After 10 minutes, rinse well with warm water. 4. Rinse brush clean with warm water and soap. Air dry for storage. Use 1-2 times a week or as needed. Caution: consult your doctor before use Manuka Bee Venom Anti Wrinkle Mask if you have bee allergies. Kakadu Plum Brightening Sugar Mask: Propylene Glycol Dicaprate/Dicaprylate, Sucrose, PEG-7 Glyceryl Cocoate, Stearalkonium Hectorite, Euphorbia Cerifera Wax, Terminalia Ferdinandiana Fruit Extract, Propylene Carbonate, Ascorbyl Palmitate, Benzoic Acid, Phenoxyethanol. Manuka Bee Venom Anti-Wrinkle Mask: Aqua\Water, Isocetyl Stearate, Butylene Glycol, Isostearyl Stearoyl Stearate, Stearic Acid, Glyceryl Stearate, Tromethamine, Butyrospermum Parkii (Shea) Butter, Ozokerite, Bee Venom, Nelumbo Nucifera Stamen Extract, Nelumbo Nucifera Germ Extract, Zingiber Officinale Root Extract, Centella Asiatica Leaf Extract, Lilium Longiflorum Bulb Extract, Glycyrrhiza Uralensis Root Extract, Ganoderma Lucidum Extract, Angelica Acutiloba Root Extract, Glycine Soja Seed Extract, Phenoxyethanol, Polysorbate 60, Sorbitan Stearate, Caprylyl Glycol, Xanthan Gum, Carbomer, Disodium EDTA, Benzoic Acid, Parfum\Fragrance, Benzyl Benzoate, Benzyl Salicylate, Hexyl Cinnamal, Limonene, Polysorbate 20, Yellow 5\CI 19140. Golden Root Purifying Mud Masr: Aqua\Water, Kaolin, Butylene Glycol, Magnesium Aluminum Silicate, Propylene Glycol Stearate, Stearic Acid, PEG-100 Stearate, Glyceryl Stearate, Phenoxyethanol, Rhodiola Rosea Root Extract, Camellia Sinensis Leaf Extract, Ganoderma Lucidum Extract, Angelica Acutiloba Root Extract, Zizyphus Jujuba Fruit Extract, Chrysanthemum Sinense Flower Extract, Lilium Longiflorum Bulb Extract, Polysorbate 60, Disodium EDTA, Sodium Dehydroacetate, Parfum\Fragrance, Benzyl Benzoate, Benzyl Salicylate, Hexyl Cinnamal, Limonene, Benzoic Acid, Xanthan Gum, Iron Oxides \ CI 77491, CI 77492, CI 77499.